WE BELIEVE PROTECTING TROPICAL RAINFORESTS HAS A GLOBAL IMPACT. Deforestation is responsible for nearly 15% of the carbon emissions that contribute to global warming. 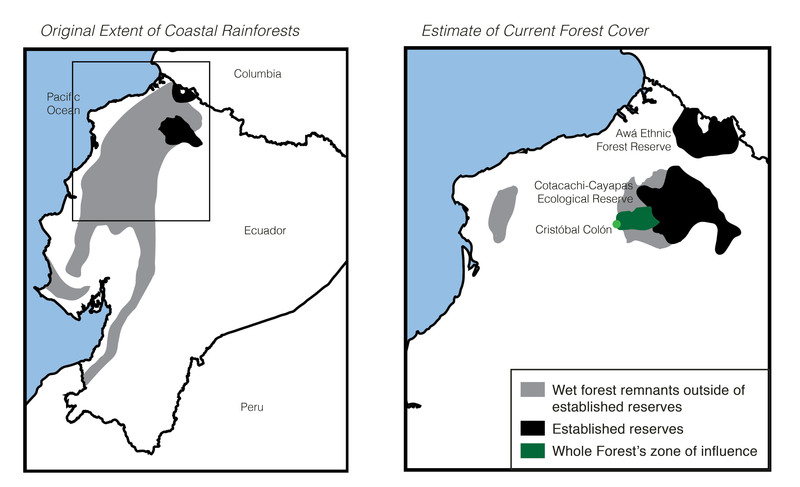 Ecuador’s coastal rainforests are among the most threatened forests in the world. Clear-cutting has lead these ecosystems to be reduced to less than 10% of their original range. Yet, this region remains one of the most biodiverse areas of the world. In collaboration with surrounding foundations, we intend to protect the Chocó Wet Forest, one of the last remaining habitats for a host of rare and endangered species. In defense of this biological diversity, trees are chosen for extraction based on their importance within the surrounding ecosystem, not their monetary value. Following exceptional standards of sustainable forestry, we only harvest about 2.3 trees per acre every 20 years. For extraction, only portable sawmills are used. We’ve also spent years innovating a system of cables to seamlessly transport wood out of the forest. By preventing the need for roads, the surrounding wildlife has remained undisturbed. Conserving these rainforests will prevent a significant amount of carbon from being released into the atmosphere. This means that all of our products are intrinsically carbon negative. It is our hope to offer an effective alternative to global deforestation, and to have a global impact on climate change.